Nothin’ says lovin’ like something from the oven, so what better way to show your love during Christmas time (or anytime) than a batch of freshly baked treats? 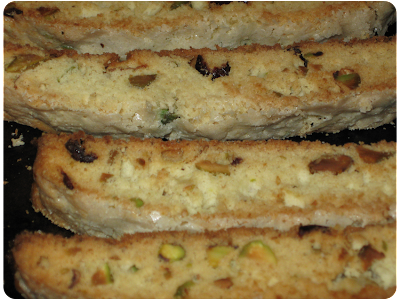 My indulgence of choice is Biscotti and I bake a batch or two every Christmas to give as gifts. They’re fairly simple to make and you get a lot of recipients thinking you're some kind of kitchen genius because they never even knew that it was possible to make biscotti yourself (because they obviously come from the elusive biscotti tree). In other words, pretty minimal effort with a big ‘I’d-say-thank-you-but-my-mouth-is-full-of-Italian-cookie-goodness’ factor. I like to make an almond batch and a pistachio-cranberry batch, which is both delicious and Christmas-colored, so win-win. Here’s the basic recipe for the almond biscotti but you can replace the almond with any other nut and/or add dried fruits, various extracts (anise is also popular) or other goodies. 1. Mix butter and 1 cup of sugar in a mixing bowl until fully incorporated. Add eggs and beat well. Stir in almond extract. 2. In a separate bowl, mix flour, baking powder and salt. Add to butter-sugar mixture and fold in slivered almonds. 3. Divide dough in half and spread each half into a rectangle (about 3" - 4" wide) onto a cookie sheet lined with greased foil. Brush each with milk and sprinkle with remaining 1/4 cup of sugar. 4. Bake at 375 degrees for about 20 minutes or until golden brown. Remove from oven and lower temperature to 300 degrees. 5. Cool both rectangles for 15-20 minutes on a wire rack or wood cutting board. On cutting board, slice rectangles into 1" thick pieces (the ends will need to be cut off and discarded - into your belly). I use a bread knife for this. 6. Lay down cut pieces on ungreased cookie sheet and bake for 10-15 minutes to toast. Flip over and toast the other side for 10-15 minutes. Wrap in festive tissue paper, place in a nice gift bag or box and attach a handmade gift tag to make to perfect heartfelt gift. 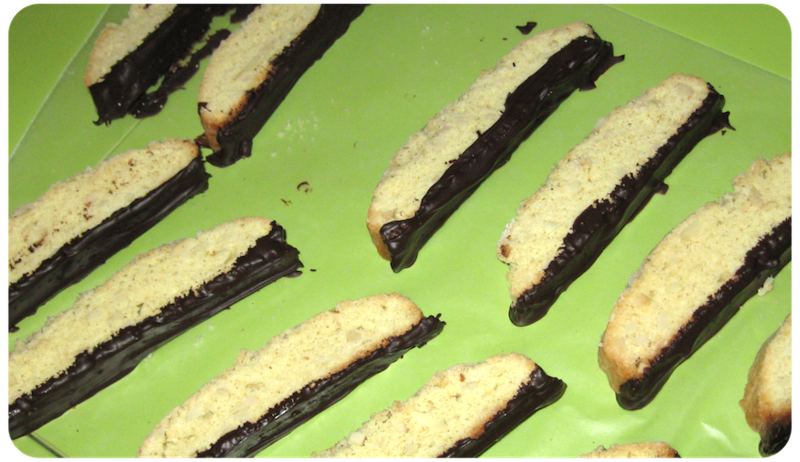 Optional: Melt dark chocolate and dip one end of each biscotti into it, allowing it to cool and harden on wax paper. 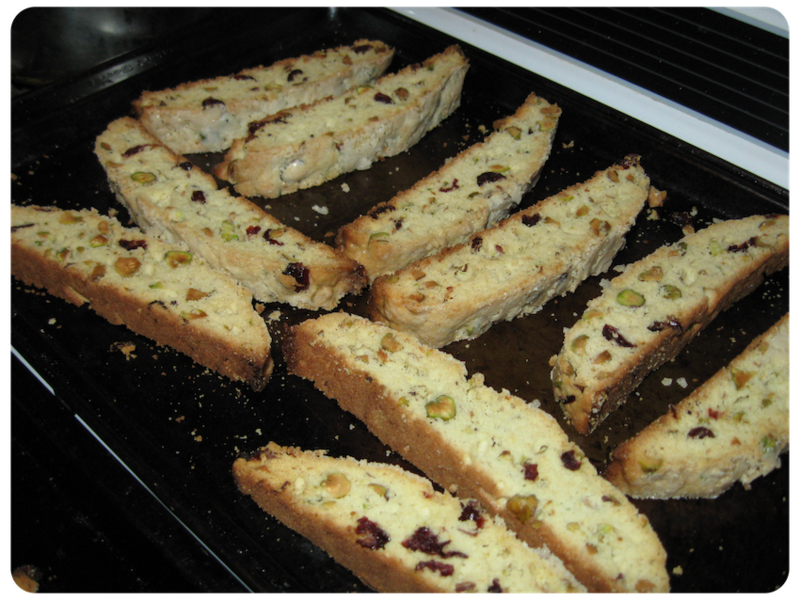 To make the pistachio-cranberry biscotti, replace almonds with pistachios and add 1 cup dried cranberries (Craisins).